As our favorite London-based/native Texan photographer Lilly Husbands captures perfectly, Marfa, Texas, is equipped with one of the most enchanting comfortable/rugged hotels one might dream up. Especially when there's a full moon on offer. Tumble out of your bug-spattered car on pin-and-needles legs into the dust of El Cosmico, a sophisticated trailer park and campground where I once spent a single and very alert Bastille Day night alone in a yurt under big skies and leaden Pendelton blankets. Though it is basically untrue, I have it in my head that Marfa is so far away that when poet Robert Creeley fell ill there at the age of 78, he died. 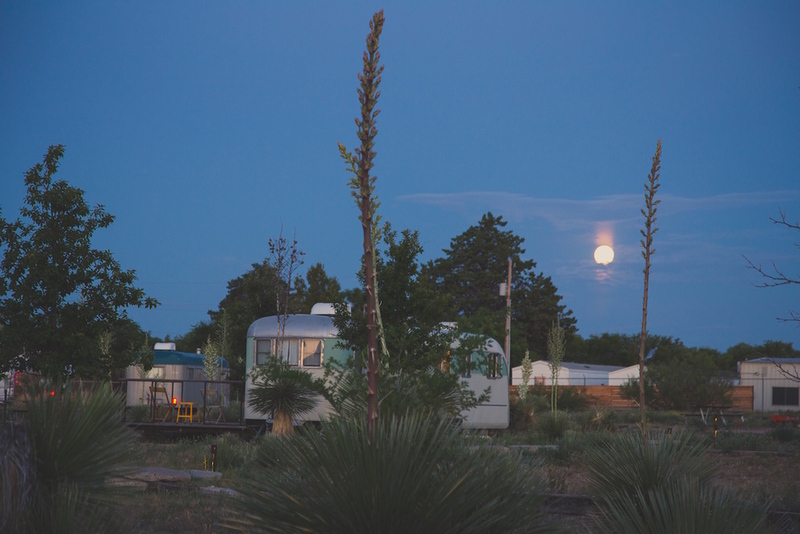 Marfa is nestled well within the emptiest, most rugged part of that sprawling state. It’s a good stopping point on the way from eastern parts of the country to Big Bend, to Tucson, to Los Angeles, but it’s otherwise very out of the way. 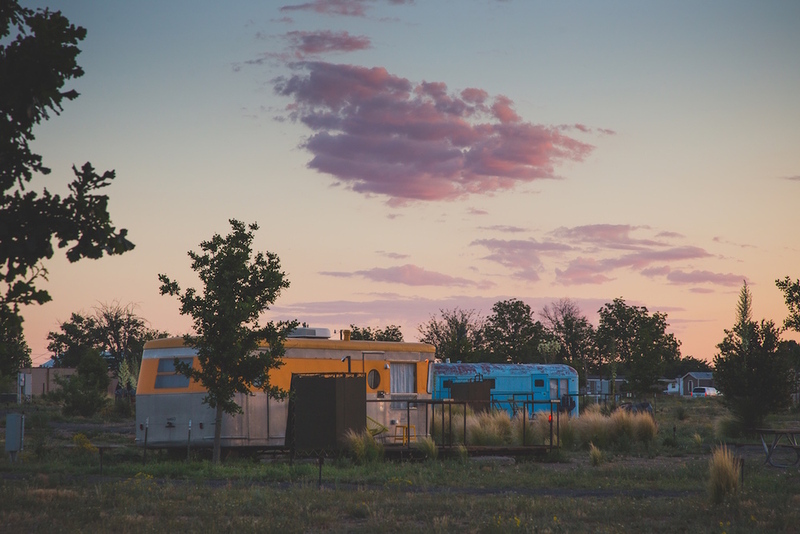 Marfa is a day’s drive west of Austin, half a day east from El Paso. Cut off from better-populated Mexico by the Rio Grande and the loads of black Tahoes that patrol the country roads, the closest commercial (American) airport is a few hours to the north, in Midland-Odessa. Marfa’s a place (a former fort) Donald Judd spotted from an airplane, which he then bought and where he lived, and made and installed art in a converted airplane hangar with help from the Dia Foundation - now the Judd Foundation and the Chinati Foundation offer tours to visitors keen to see witness the meticulous and striking installation of the artist’s work. To write poetry, one must waste a good deal of time, one must simply “be,” one must wander around with no particular aim, and it is precisely from such a lacuna that poetry arises. It is hard to explain, like most important things. But in today’s world it has become harder and harder to waste time. Artists are desperate for the simplest thing on earth: being. The Marfa residency gave me that gift. Of course Marfa itself is no lacuna. It’s a quiet, fashionable, rough town with a single stop light and one bar (if my memory serves me) and no grocery store to speak of; it also contains a beautiful museum, archives, and one of the best, most delightful bookstores I’ve ever known. A throwback to a time when everything in the west was so distant, Marfa Public Radio broadcasts (from next-door to the bookstore) far out over the flat deserty landscape, for the most part reaching those who live there. And the long distance drivers, maybe reminding them that they are so far, fathomlessly far, from NPR’s Car Talk and Terry Gross and the bodegas and restaurants of cities like Boston and New York and Philadelphia, on the one end, and Los Angeles or San Francisco or Portland on the other. The first time I visited Marfa was part of a class trip that brought about 80 of us (teenaged girls) from Dallas to West Texas. All I remember of the place was the twilit drive to a field just out of town, and getting off the bus to stand in the narrow strip between barbed wire and country road to watch for the mysterious lights that occasionally dazzled the field’s visitors after dark. Now there’s a cozy roadside Viewing Area 20 miles out of town replete with a little parking lot, benches, and waterless toilets and sinks. Since that first time I’ve been back to Marfa twice, on my way from New York to LA - first with my best friend, who was driving me, and then on my own, on my way from LA to Austin. The first time was worth infinitely more than this mention, but is too special to me still to share. The second time I stayed at Liz Lambert’s totally charming El Cosmico. Both experiences were magical. A big sky overwhelming the flat, long landscape. My preoccupation with being so far from home and convenience. The close insomnia of massive nights and thoughts. And (despite the very cool population): the striking aloneness of such a distant, foreign place. Lilly Husbands. London dweller. Native Texan. Landscape & Travel Photographer. Film Researcher. Experimental animation & cinema specialist. Find more from Lilly at lillyhusbandsphotography.com and https://instagram.com/lillylalaloulou/.